British business leaders warned for months that if U.K. voters chose to exile themselves from the European Union, there would be swift, negative consequences. On Friday, their fears were realized. The pound was hammered, bank stocks plunged, and investors preyed on companies that do a lot of business in the U.K.
British Airways owner IAG (ICAGY) almost immediately issued a profit warning. The company said it anticipates minimal long-term impact, but it issued a profit warning because of a difficult trading environment and current market volatility. Low cost airline EasyJet (ESYJY) was slammed. The stock fell over 14% Friday. CEO Carolyn McCall said the company doing everything it can to ensure "the U.K. remains part of the single EU aviation market" so planes can still fly freely around Europe. Aftershocks from the vote were felt widely: Big banks, many of which run their European operations from London's Canary Wharf, were among the hardest hit. Barclays shares were down 20%, Lloyds Bank (LLDTF) 21% and RBS 18%. It's possible that thousands of jobs will be cut in the sector, as many banks have threatened to move their operations out of London. U.S. banks also got hit, feeling the downsides of the American-British "special relationship." Morgan Stanley (MS) fell over 10%, Citigroup (C) slid over 9% and Goldman Sachs (GS) was down 7%. Invesco (IVZ), an investment firm headquartered in the U.S. but with a substantial presence in the U.K. was the worst performer in the entire S&P 500, falling nearly 14%. The company did not respond to CNNMoney's request for comment. There's now a real debate if London will remain a global financial capital. In a message sent to staffers, JPMorgan (JPM) CEO Jamie Dimon said the bank's 16,000 employees in the U.K. would continue to serve clients as usual. He warned, however, that the bank may "need to make changes to our European legal entity structure and the location of some roles." It wasn't just big banks, though. The FTSE 250, which is made up of mostly mid-sized British companies, plummeted 7.2%. Moody's warned that automakers, manufacturers and food producers in Britain could suffer from higher trade barriers and reduced volumes. The credit ratings agency said increased regulatory risk would hit telecom firms, airlines and drug makers. Ford (F), which has nearly 14,000 workers in the U.K., fell over 6.5%. The company told CNNMoney it would "take whatever action is needed to ensure that our European business remains competitive," although it has no plans at present to make any changes. Related: Brexit: Is this like the 2008 financial crisis? Other U.S. stocks with a big presence in Britain also fell sharply. Companies that make car parts like BorgWarner (BWA) and Delphi Automotive (DLPH) tanked about 10% each. Travel site Priceline (PCLN), which has a lot of revenue coming from Europe, fell over 11% and American Airlines (AAL) (a partner with British Airways) lost over 10%. 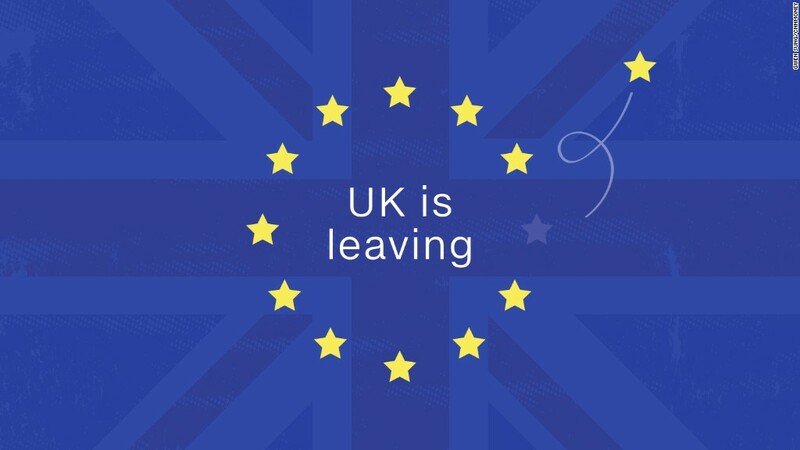 There are tremendous levels of uncertainty facing British businesses. London must now establish new trading relationships with its major foreign partners, and determine the immigration status of EU migrants currently working in the U.K.